Because these permanent fixtures can not be moved very easily, it is nearly impossible to rearrange them. The most valuable item that you have total control over is the vanity. This item needs to be chosen on a personal level by you. You also need to choose a mirror that represents your home along with the warmth you want your guests to feel as they enter your newly redesigned bathroom. Every room in the whole house may be decorated to the max but the restroom is one stop that most guests make after they enter your house. There is a very good possibility that your dining room or your den can be seen but they are not looked at like your bathroom is. With a smaller space they are going to notice the details more on your vanity and what colors you accented the whole room with. Guests notice things even more when they enter a room without any distraction. So make sure it gives off the impression you want. Also make sure that you pick a higher quality vanity because this is what will give off your personal image. You need to keep in mind that most people check out how they look before leaving the bathroom. 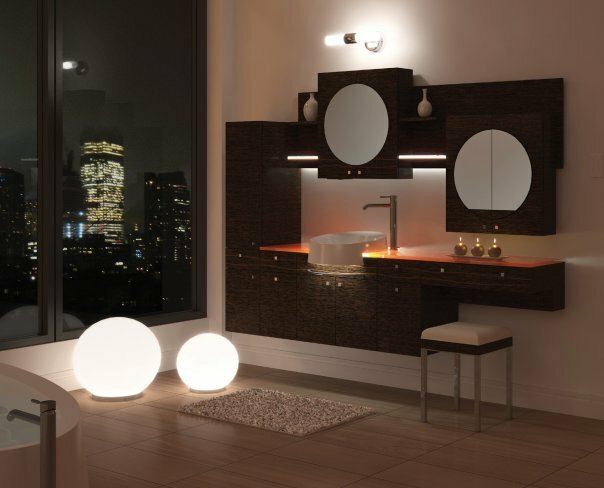 It is guaranteed that your guests are going to look closely at the bathroom vanity when they are staring at their image in the mirror. The main details they are going to study will be the type of trim that is keeping the vanity in place and whether the proportion of the vanity is right for your bathroom. When you decorate your bathroom don't just put in a plain vanity. It is considered tacky and will not give off the warmth that you are hoping your guests feel when they enter your restroom. The biggest piece that will help connect the whole room will be the customized vanity. You can not afford to leave the vanity out of the bathroom. What an elegant interplay of shape and texture! TIP: If you're looking to add some warmth to your bathroom, a natural wood trim on your bathroom vanity (espresso / dark brown, black walnut, amber red) would accent it perfectly. The two popular themes in the bathroom are the simple and plain white look and the warm, inviting touch of wood.